What makes prices rise? There are two traditional explanations: a squeeze on supply, or an excess of money. But neither explains why consumer inflation is now slowing in much of the world, most recently in the UK. The answer may in fact be sociological and demographic. An employee of PT Bank Negara Indonesia Tbk. 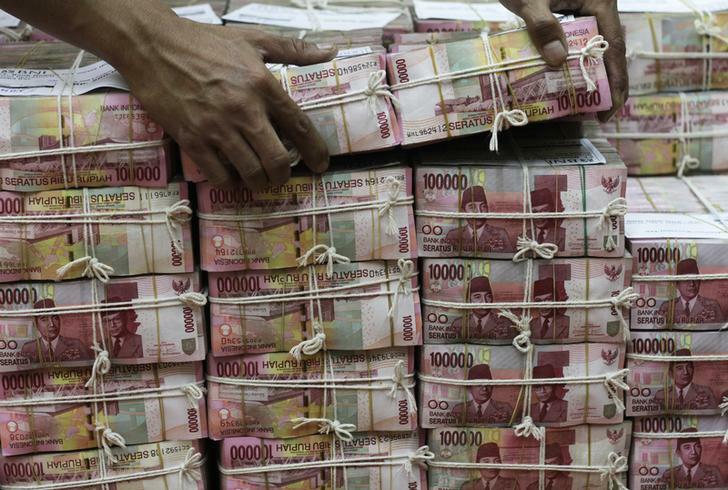 moves a pack of 100,000 Rupiah notes at the bank's head office in Jakarta. The UK annual consumer price inflation rate in October was 2.2 percent, according to official statistics released on Nov. 12. The average forecast of economists polled by Reuters was 2.5 percent. In September, the annual rate was 2.7 percent. Consumer prices in Sweden were 0.2 percent lower in October than a year earlier, according to official statistics also released on Nov. 12. The final calculation of the annual inflation rate in Germany was 1.2 percent, down from 1.6 percent in September. Consumer prices in Portugal were unchanged over the year. In Spain, the ministry of employment announced that 30 percent of workers with collective bargaining agreements have agreed to flat or falling wages for 2014. Among sectors with increases, the average gain will be 0.55 percent.